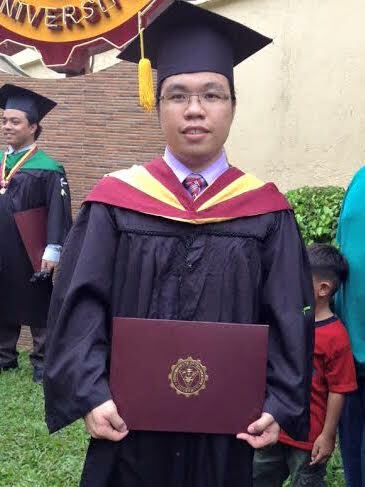 There was a time when Jurich Sungcad, a young man from the Philippines with hemophilia A with inhibitors, wasn't sure he would ever finish his education due to so many bleeds. But Save One Life didn't give up on him. With Save One Life’s financial help, today Jurich has a bachelor's degree in electronics engineering and recently found a job as an associate software engineer. Moreover, he is the president of the Hemophilia Association of the Philippines, a voluntary position that he carries out with much flair. Jurich was one of Save One Life’s first beneficiaries in the Philippines in 2008. He was enrolled in the sponsorship program through his patient organization, Hemophilia Association of the Philippines-Cebu, and recieved over USD$200 annually to help with health and education expenses. In 2015 Jurich also received a scholarship award in the amount of USD$1000 for the last two years of his bachelor’s degree. According to Jurich, the scholarship came just in time. Family relatives had withdrawn their financial support, as they began to think it was useless to support someone who is so frequently hospitalized. Jurich, who is the oldest of four children, was diagnosed with hemophilia when he was six months old. His parents had noticed bruising surrounding his armpits from being carried. His younger brother also had hemophilia, but passed away at the age of seven from a cranial bleed when he bumped his head against a wall. Losing his brother to the same disease was terrible for Jurich. During his childhood Jurich was often upset when he could not move due to swollen joints. Forced to rest with ice and compressions, he experienced life from the sideline. During his elementary school years, Jurich felt socially secluded from his peers. Most of his teachers would try to isolate him during play times, afraid of what might happen. During his high school years he experienced his first excruciating psoas bleed. He would receive factor replacement therapy when it was available; most of the time he received fresh frozen plasma or cryoprecipitate. Today Jurich has several target joints and his right leg is smaller than his left from severe muscle atropy. Jurich found it hard to find a job due to his malformed leg, as most entry jobs in engineering are physically demanding. Often he was forced to expose his hemophilia and would then not be called back. But Jurich never gave up, and recently he was hired as an associate software engineer at Accenture. Meanwhile, as the president of the Hemophilia Association of the Philippines in Cebu, he motivates other hemophilia patients to overcome their problems. Under his leadership, he started to build a hemophilia database, but with the Philippines being a country with 7,107 islands, it’s a challenge to find hemophilia patients. Often patients have to travel by boat for several hours to reach the hospitals. And who knows how many persons with hemophilia are struggling in the tiny far flung islands.